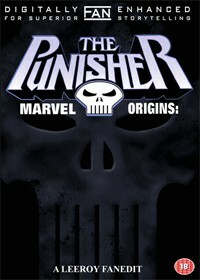 The Punisher character is dark story of revenge and murder and while the film remains faithful to it’s source material for me a lot of this didn’t work. Working from the extended cut in which the character Jimmy Weeks played a more important role, I removed other elements of the film focusing purely on Frank Castles lust for revenge. The 2004 Punisher movie had two of the worst characters in Spacker Dave (Ben Foster) and Bumpo (John Pinette). They were too stereotypical and brought unnecessary humour to film about revenge. They appear briefly in the cafe scene but have no other involvement. The character of Joan has also been removed and in doing so I’ve removed the proposed love interest between her and Frank. I didn’t like the idea that Frank could find love so soon after losing his wife. The film also has this morale tale that Frank could be a normal person if he choice’s to be. I wanted a Punisher movie were the main character had been tipped so far over the edge that they was just no way back for him. Also removed is the scene were Frank relives himself to the media. He asks why no one has been arrested for killing his family then starts killing everyone connected and the police don’t do anything? The family massacre scene has been trimmed and is no longer two family’s that are being wiped out. The popsicle from torture scene has been removed along with Mickeys voice over. It makes Frank Castle character a lot more darker and shows the lengths in which he’ll go to the truth. Removed Popsicle from torture scene and Mickeys voice over. 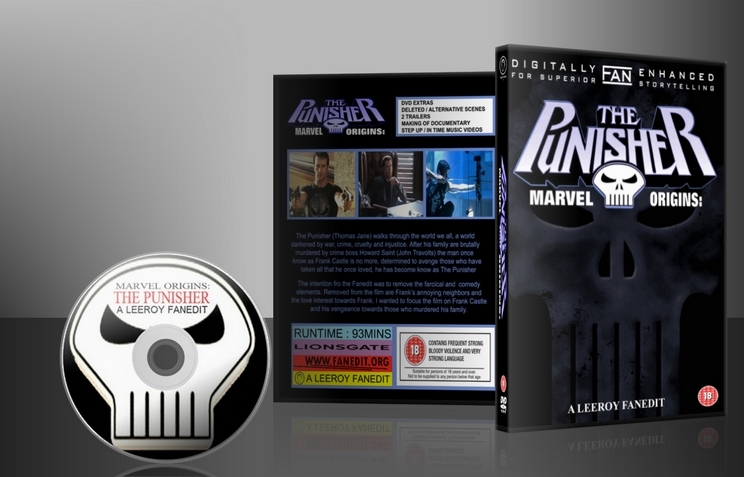 A worthy fan edit and definitely made the film a straight-forward Punisher film. Eliminated a lot of nonsense and focuses on the revenge and justice portion of the film which was much needed. I find this to be my favorite way to watch the film now and only hope for an HD form to obtain as the DL was sub-par in quality in the video department. Thank You to the maker, you did an excellent job! I downloaded the full dual layer DVD, to then use my pal DVDShrink on it and was pleased to find that the movies takes about as much space as a single layer disc which is great for my particular burning hardware situation and even if i had the hardware i know from experience fact that dual layer burning is a pain. It’s clear that leeroy worked hard on making a cool menu and a number of special features, and dumping them is not what I’d prefer to do, for which i can only say sorry. Edit – to be honest The Punisher character has never been one of my favorites, Marvel keeps trying to sell him as edgy corner of their otherwise superhero heavy universe and he often falls into a cliched heavy mobster hating/vengeance territory. For stand alone movie purposes I would have expected a dark tale of vengeance, and that I did not get some years ago. Now in this edit leeroy gets into the hard labor of removing some very thick layers of cheese that plagued the original release. Dumb comic relief characters have been heavily toned down or almost completely excised – specially Frank’s neighbors! ; and whatever else had to be lost in order to remove them is more than justified. I also read that a post family execution character that would have a love interest was excised, something that I just couldn’t remember even being there originally, yet I agree that that kind of thing would have been so out of place that words couldn’t describe it. Only negative is that I guess we lost Rebecca Romjin from gracing our screens but you can’t have everything. Other small things are improved, such as a better pace so that the movie doesn’t drag on forever and somehow made Frank seem more smart and cunning with his revenge planning/implementing to me which was really good; specially during the climatic assault on the gathered mobsters and hitmen at the club. Overall I have to say that I was entertained and enjoyed the experience exponentially more than I did the original, so a major credit goes to leeroy for that; Travolta will never be my favorite actor, and seeing him as a menacing antagonist is just too improbable for me but well thats impossible to fix. Only one last note: I wish that the scene where Frank’s son gives him the skull t-shirt would have been taken out as i find it very corny.